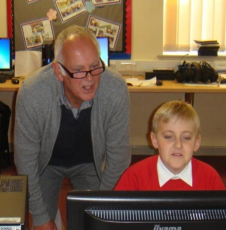 My name is John Allum, a retired Company Director, and currently the Chair of Governors at Eskdale School. I was born in Chilwell, went to school in Chilwell and after serving 10 years in the Royal Navy Fleet Air Arm I eventually returned to Chilwell to live and work. Both my son and daughter were both pupils at Eskdale, enjoying a brilliant education and preparation for their successful futures. It was during my children's time at Eskdale that I was encouraged to join the Friends of Eskdale and after a few years to apply to become a governor. Being part of the Eskdale community for nearly 20 years has been very enjoyable and has enabled me to have a very broad insight into how the education system works and how difficult it is for schools to prepare and deliver budgets, and at the same time maintain the high standards, outstanding pupil achievement and development, all through outstanding leadership and teaching. My role as a Governor has involved monitoring finances and leadership, including interviewing and appointing the Head Teacher. Everyone who is part of the Eskdale Team and community should be justifiably be proud of the school. I have been head teacher of Eskdale Junior School since January 2011. Prior to becoming head teacher I was deputy head in two different schools, one in Sutton-in-Ashfield and the other in East Bridgford. As head teacher of the school I sit on both governor committees and welcome the support and challenge that the governing body bring to the school. Being headteacher of Eskdale Junior means a lot to me. My wish for the pupils, parents and governors of the school is that we continue to provide a high quality education for all pupils using our core values to develop children both personally and academically. My hope is that we can provide all pupils with memorable experiences that they will look back on years to come with great fondness. I have been a sub postmistress of a local post office for 24 years, which I sold over the summer. Currently I am enjoying time out from the hectic environment of running a business. I have business and legal experience as I am a qualified solicitor. I became a governor because I wanted to contribute to the school where both my boys had a very positive and happy experiences. I felt my business experience would be good contribution to the financial element of the school. In my spare time I am a keen photographer and I enjoy a good keep fit regime. I have lived in Chilwell all my life. I have been married for 47years I have 4 birth children and 8 adopted and also fostered many children over 28 years.I have had an association with Eskdale school for 40 years.I have always valued the help from Eskdale within our fostering career. I am proud to be a governor of such a fantastic school, working alongside; staff a great head teacher and a committed governing body. I am chair of the pupil and personnel committee and also share the role of headteacher appraisal governor. I am retired so I hope to give more time to the school and enjoy going into school to help and love going on the school trips ,I am always very proud of the children on these outing because the behaviour of the children is always exemplary which I feel reflects Eskdale school. I feel very passionate about the school and hope to continue being a governor. I have been a teacher at Eskdale Junior School since September 2013. Since qualifying as a teacher I have gained experience from teaching in a number of different schools, teaching children across the primary years, which has provided me with a unique perspective on school effectiveness. Pursuing a new challenge I arrived at Eskdale Junior School, where I immediately felt welcomed and have enjoyed being part of such a brilliant, hardworking and fun group of people. Now that I am staff governor, I aim to support fellow governors in their understanding and involvement in all aspects of the schools work and future development. In addition to this, I welcome the opportunity to provide both support and challenge for school leaders in ensuring we continue to make Eskdale the best it can be. It is great to work as part of our strong team of governors who are dedicated to securing the high quality teaching of skills and knowledge as well as, enjoyable learning experiences for all our pupils. Outside of school I love to spend time with my busy family building memories. I became a teacher in 1970 and began my career at Eskdale Junior School, where I spent ten very happy years until I left to become a mum. I returned to full time teaching when my daughter was 5, and I became Deputy Head Teacher of Bramcote Hills Primary School in 1993, retiring in 2010.
whole school co-ordinator for curriculum planning and development - guiding and monitoring teaching and learning - gifted and talented provision - personal and social education - home, schools and community links - staff appraisal. As deputy, I was on the interview panel for appointing new teachers and I attended the governors’ committee meetings. I also enjoyed being a member of the school’s P.T.A. Children each have their own individual personalities and abilities, but they all need to be, and to feel, safe, valued, engaged and supported in what they are doing, and confident that, by trying, they can make progress. I hope to contribute in helping to ensure that all of the children at Eskdale can fulfil their potential, get on well with others and have fun. Recreationally, I enjoy entertaining my two young grandsons, playing golf, compiling and competing in quizzes, gardening, walking and singing. I loved every minute of my years as a teacher and look forward to sharing really good times with everyone at Eskdale. Intuitive, analytical and enthusiastic, I joined the Royal Engineers as a Plant Operator Mechanic in 1994, maximising my enjoyment of physics, maths and engineering. The Amy life has taken me all over the world, including Hameln (of Pied Piper fame), Falkland Islands and more recently the Caribbean Islands. Life experiences cannot be summarised here, but suffice to say differing cultures, languages and poverty keep things in perspective. Governor related, the Army gave me a chance to gain an NVQ Level 4 in Learning Development. This showed me many things I never knew about teaching, mentoring and coaching as well as learning styles and difficulties. I really enjoy these areas and have spent a good deal of time either training or conducting training development across the Royal Engineers. I also enjoy analysing any process or system and making it better. The arrival of my daughters Lilia and Sophie changed my life, and I’ve always wanted to be involved in their development and maximise their potential. I started at Leuchars in Scotland as a Board Member of the military funded Nursery. This was an important a taster and I enjoyed it, but I was keen to do more. Knowing Lilia was due to be in Eskdale a while longer and that Sophie was due to start the following year, I saw this as the opportunity and have enjoyed it from the start. As a civil engineer, project and personnel manager, the Army has also provided me with financial and resource management experience, which should all help with my role. Also understanding the nuances of military life, the role as Parent/Military Governor seemed ideal. My name is Janet Kennedy and I am currently serving as a parent governor. I previously served as a parent governor and then a co-opted governor for six years at my children’s infant school. My background is in computing and I have a degree in Software Engineering. More recently my interests have been more with mathematics from foundation stage to ‘A’ level and beyond. This includes an interest in how maths is taught in school settings. I’ve been involved in mathematics tutoring and volunteering at infant school level. My reasons for wanting to be a governor stretch back to when my sons first started school and needed quite a lot of support. I became a governor of their infants’ school as a way of giving back something to the school. I am delighted to have the opportunity to support Eskdale Junior School in a similar way, which has also supported my children greatly. My main aim is to see all children at the school thrive and achieve their best. In my spare time I am an amateur genealogist. I’ve been researching my family tree for over 20 years, have traced ancestors back to the sixteenth century and have recently surpassed 50,000 entries. I also volunteer with year four pupils at the school. Since 2000, I have held a number of Chief Executive roles with national professional associations; these roles required me to work with a wide range of organisations in both the commercial and regulatory sectors as well as with a number of Government departments. In 2007, I started my own company which specialised in business support and business development; specifically for professional associations and this is something that I continue to do today. In addition to my business commitments, I also hold a number of Non-Executive Director positions. In 2014, alongside my wife, we launched a registered charity called Forever Stars, which supports bereaved parents and families that have experienced baby loss, this was as a result of our own baby loss experience in 2013. As well as being the co-founder of this charity, I am currently the Chair of the Board Trustees. We are proud to have a son currently attending Eskdale Junior School and have two more children who over the coming years will also hopefully be joining the ranks as an ‘Eskdaler’. I am honoured to be included on the Board of Governors at Eskdale and I hope that my involvement will help to continue the wonderful work being carried out at the school as well as help improve areas where there is the opportunity to do so. In my ‘spare’ time, I am a passionate (long suffering) Nottingham Forest supporter, love to go to the theatre and enjoy making amazing memories with the family (especially when Disney is involved! ).